Inder Loves Folk Art: Some weekend highlights. (1) Joe actually wore his Luka hoodie! Willingly! And pointed out, with pleasure, the blue trains on the sleeve and the big "secret" pocket! This is a big deal, because unfortunately, Joe has been categorically opposed to this hoodie (which I freakin' slaved over, people) since day one. Excited to go see his cousin. In his "blue train" hoodie! To be fair, Joe is morally and ethically opposed to outerwear of any kind. So it's not exactly personal. It's a good thing we live in a mild climate, where long sleeved t-shirts are enough to keep hot-blooded little boys warm enough on most days. (2) Joe has a new "camera face" now. As of yesterday, this is what happens when I tell him to "say cheese!" I think he looks like my mom when he does this. Sorry, Mom! (3) With his third birthday looming on the horizon, I've started really trying to work with Joe on potty-training. Up until now we've been vaguely encouraging Joe to use the potty, but Joe hasn't shown much interest (and you know, hasn't been that verbal), and we haven't gotten very serious about it. Today I bought him some Thomas the Tank Engine underwear, which he was really excited about until he realized it was supposed to go on instead of a diaper. At which point, he demanded that I put his diaper back on. Hm. According to Dr. Sears, "If your toddler is going through a generally negative mood in which he resists all interventions and his vocabulary is limited to the two-letter word 'no,'" hold off on potty training for a few more weeks and catch him at a more receptive time. Problem is, Joe's been in an, ahem, "negative mood" for like, the past year. So. Wish me luck! 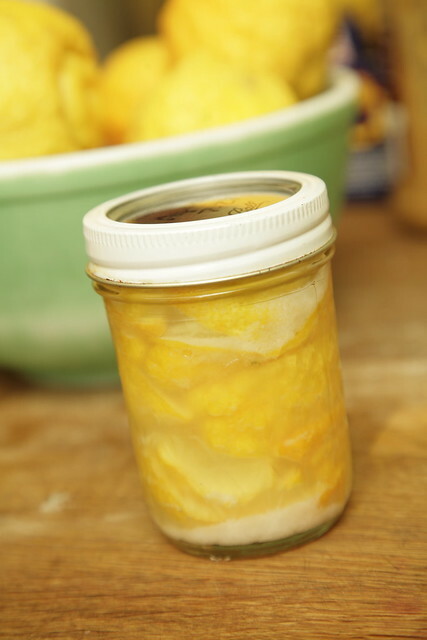 (a) Preserved lemons. Sliced lemons packed in kosher salt and their own juice morph into a soft sour-salty-bitter pickle that is delicious in Middle-Eastern cuisine, and in our house, salad dressing. The high acidity brine keeps the lemons from going bad for up to a year. Warning: The combination of salt and lemon juice will eat through anything, including mason jar lids. (b) Unphotographically hideous, but nonetheless delicious glazed lemon cookies. They got slightly burnt, and the glaze is clumpy. Even by the "homely goodness" standards of this blog, they do not make the aesthetic cut. However, they are sweet and lemony and you can eat around the burned bits. (c) Grog. 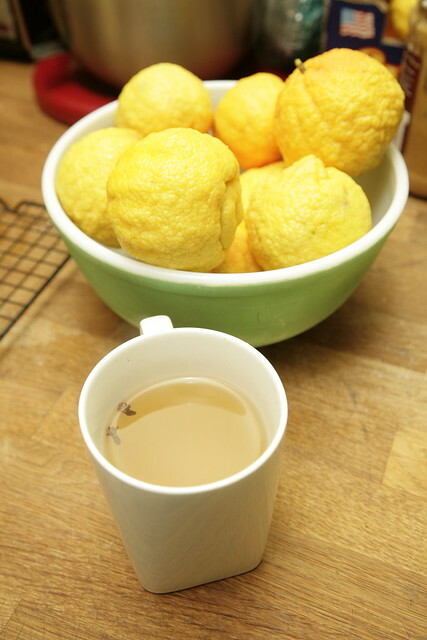 That's lemon juice with rum, hot water, whole cloves, and cinammon. Mug of grog. This batch of lemons is strangely warty and lumpy, but still has that unmistakeable Meyer sweetness. "Hey, I need this to prevent scurvy." Obviously, I did not partake in the grog (oh, the sacrifices we make for our unborn children! ), but from the exclamations of "Ay ay, Captain!," "Arrr!," and "Yo ho ho and a bottle of rum!" I'm hearing from the kitchen, I'd guess it's pretty good (and definitely effective). LOVE Joe's camera face. 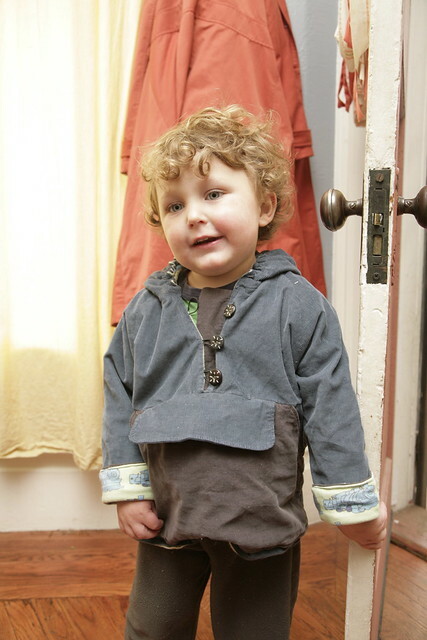 And glad it's not just my small boy who is against the notion of outerwear. He spent practically all last winter in short-sleeve t-shirts over long-sleeve ones. I hope the blue train hoodie love (or acceptance at least) continues! Mmm. Lemon grog, sounds good. What is it about boys and outerwear?? Joe screams "NOOOOOO!" if I so much as pull a sweatshirt out of the drawer! And ohhhh - all that lemony goodness sounds delicious! Yeah, the camera face is so dorky and funny, I can't help but laugh, even while I'm also hoping it does not become the go-to camera face for months to come! I love that goodies and have faith the the Thomas underwear will help inspire Jo to join us in the diaperless club. Hopefully it happens before your next diaper using machine graces us with her lovely presence. Andrea, we love lemons in our house! Bring on the lemons! Joe is so cute as always. 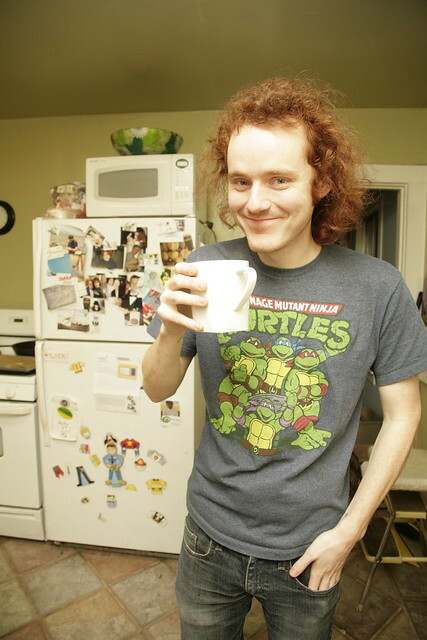 BTW tell your bro his TMNT shirt is awesome! Your little one is so cute ~ I love the camera face. 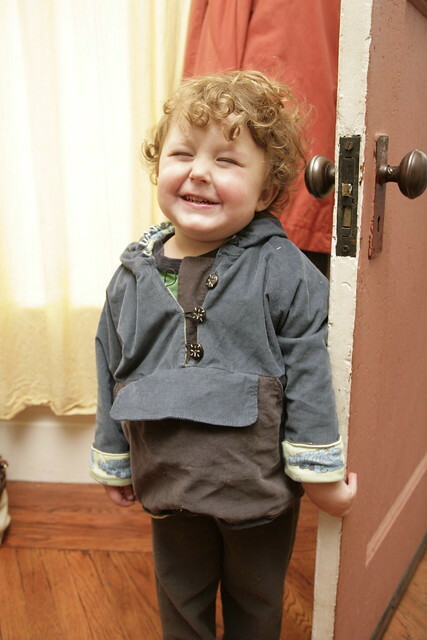 My 5yr old often pulls something similar :) I've done almost every pattern from the Sewing For Boys book EXCEPT the Luka hoodie, though I've had my eye on it right from the beginning. You may have inspired me to get started...soon. We have a lemon tree in our garden that is full of fruit and I don't use nearly as many. They mostly drop on the grass and rot. Criminal really. Your lemon cookies look lovely despite their lack of photographic qualities. What recipe did you use?